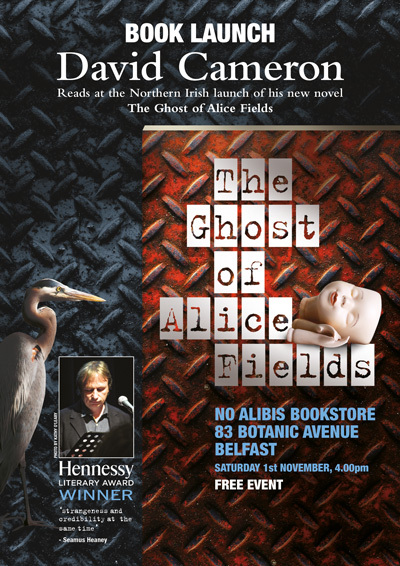 The poster for the book’s Belfast launch in 2014. Buy The Ghost of Alice Fields directly from the publisher (recommended). Buy The Ghost of Alice Fields from Amazon (UK). The Ghost of Alice Fields puts a poetic slant on the crime novel. Alice Fields, the adopted daughter of a Balkans scholar, is killed precisely a decade after Serbia’s President gave a notorious speech which heralded the Yugoslav Wars of the 1990s. In Edinburgh, the poet and newspaper columnist Jude Oswald chances upon a crime scene reconstruction, and uses his column to make an accusation that sends his already troubled life into freefall. As well as Edinburgh, a principal setting of the novel is the Fife village of North Queensferry, where David once lived. He revisits in imagination the Signal Station cottages under the Forth Rail Bridge – the cottages were used originally by engineers working on the construction of the bridge before the Royal Navy started using the location as a base. The Balkan theme is informed by David’s experience as the co-editor of a book of essays on the Balkans, and also as an official reporter on a Balkans conference in the Peace Palace of the Hague. This isn’t crime-writing-by-numbers. As David remarked on the book’s publication, his aim was ‘for there to be just as much suspense as there is in life, and no more unexpected twists than life might realistically throw up’. Click play below to listen to David reading an extract.